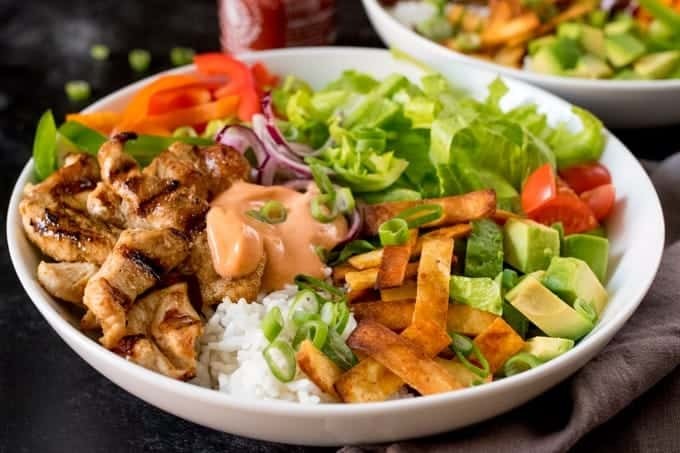 Spicy chicken Tex Mex Lunch Bowl – make it in advance for lunch! 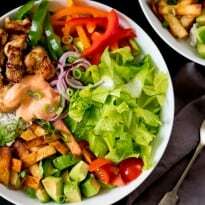 Hi Everyone, Nicky here from Kitchen Sanctuary with a spicy salad recipe that’ll make your co-workers jealous come lunchtime! I know how easy it is to default to a regular salad of leaves, tomato and cucumber. Maybe a bit of protein to jazz it up such as egg, chicken, ham or tuna. I find myself doing this too often because I’m in a rush. I’ll tell you now – I’m always disappointed – which results in a trip to the cupboard for crisps or biscuits! Well it’s time to put those consolation biscuits away, because this Tex-Mex salad will totally satisfy those tastebuds! Make the chicken and tortilla strips ahead and you can throw it all together with a pile of fresh veg. I love to use crunchy peppers and avocado – but anything goes. How about spiralized carrot and cucumber? Maybe some beans or sweetcorn too. For more salad recipes, try my BLT Salad, Cheeseburger Salad and Sweet Heat Salad. Bring this deliciously spicy salad for lunch and make your coworkers jealous! Brush a large griddle pan with a little oil and preheat until very hot. Whilst the griddle is heating, mix the chicken with 1+1/2 tbsp of the oil, 1+ ½ tbsp of the fajita seasoning and the salt and pepper. Place the chicken on the griddle in a single layer and cook – turning once – until slightly charred and cooked all the way through (about 6-8 minutes). Whilst the chicken is cooking, heat up a small skillet with the remaining oil on a high heat. When it’s very hot, add the tortilla slices to the oil. Fry for approx. one minute until golden brown, then remove with a slotted spoon and place on some kitchen paper to drain off any excess fat. Sprinkle with the remaining fajita seasoning. Divide the rice between two bowls. Arrange the sliced peppers, avocado, tomatoes, scallions and lettuce on top. Finally place the cooked chicken and fried tortilla strips on top. Mix together the dressing ingredients and serve with the Tex-Mex salad. Nicky lives in Cheshire in the UK with her husband and two children. She blogs over at Kitchen Sanctuary where she creates family friendly recipes and mouth-watering photos. Join the #CIBCHomeAdvice Twitter Chat on March 30th! absolutely incredible!! All that flavor……gonna be on my mind all day! Oh my! What a salad! I think I could eat every day. Such a pick me up from regular salad. This is a keeper. I love a good salad! Thanks for the recipe! This look amazing, thanks for sharing. I am definitely going to be making this! Thanks for this recipe. I will try it. This is to die for!! Drooling over here. Looks tasty but I’m wondering just how spicy it is? The spiciness of the chicken depends on how spicy your fajita seasoning is, but the heat really comes from the dressing. Add more sriracha if you like it spicy (the chipotle paste adds a mild heat, but it’s mostly there for the smoky flavor). This looks absolutely wonderful, unfortunately I can’t eat spicy food so it’s not for me. 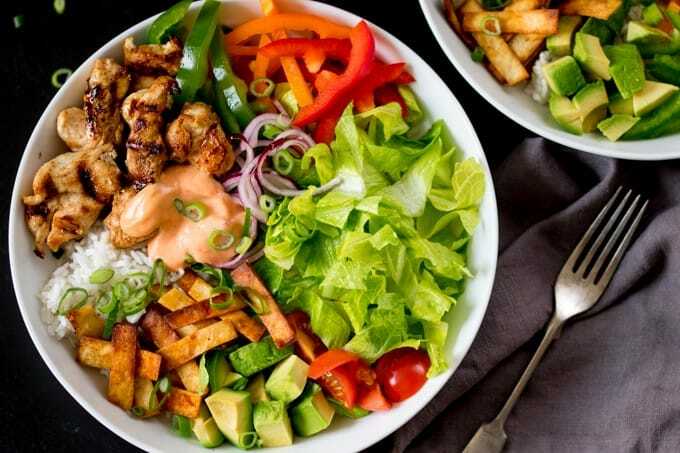 This salad looks so fresh and amazing, plus I love spicy. Thanks for sharing. This looks so delicious! Where can I find chipotle paste? I have never heard of it. It’s a strong paste that’s great for chili con carne etc. I’ve added it to the dressing for a smoky taste, so if you didn’t want to buy a jar from Amazon, you can just use some chipotle BBQ sauce – that’ll work great too. I believe they sell it in Walmart. When you put it together, this looks like a swell salad. 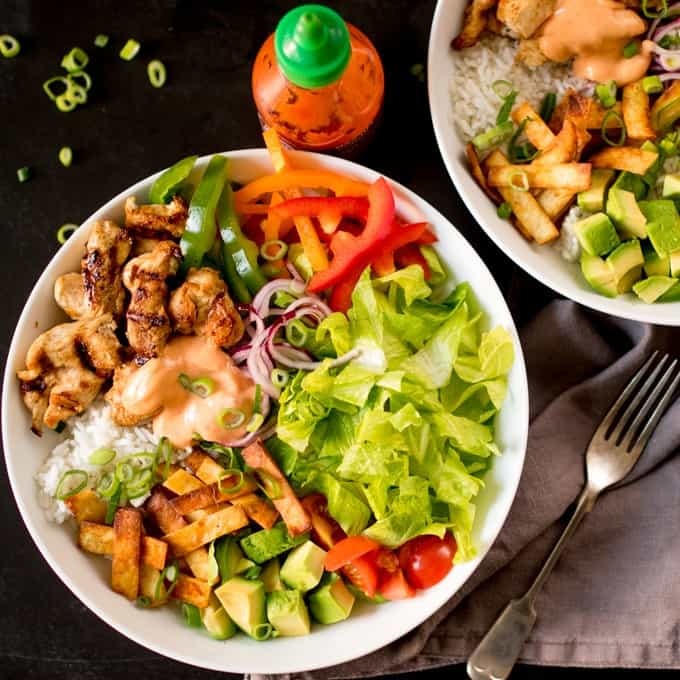 I would like to add a little Sriracha Dressing, and I am ready to enjoy! Looks yummy! Pinning as a good picnic meal. Visiting from Tutorials and Tips party. I can’t put into words how amazing this looks! I’ve been craving a good salad and it looks like I found what I’ve been looking for. Thanks for the great recipe! This looks delicious and easy to put together. I think that even my salad hating hubs would dig this one!!! What a terrific mixture of fabulous, colorful, delicious ingredients! It’s an entire hearty meal disguised as a salad – yum! This looks like a great recipe to try! This looks so good! I’m in need of good lunch recipes. Working at home and eating lunch alone most days means I usually wind up having a bowl of cereal or just some popcorn. I need to do better! This has inspired me to do a little planning and make sure I have a good lunch! I’ll start with this yummy bowl! Lol! My kind of lunch! Healthy but packs some extra flavor and a bit of spice – love it! And definitely one that won’t leave me feeling unsatisfied at having salad for lunch. Yum! What a great recipe! I love that you used tortillas to make the strips. I’ve never tried that before, but I know that’s so super simple. Thanks for sharing this recipe, I’ve pinned to make it soon. A delicious nutritious and easy to prepare meal.That’s what I look for. Delicious! We love salads and anything resembling Mexican so this would be really popular at my house. Pinning. This would be a perfect lunch for me, thanks so much for sharing it with us at Full Plate Thursday! looks delish and I can easily adapt it to my low carb way of eating! Hi Nicky! Gosh that looks delicious. I’m on a bit of a healthy eat regime at the moment. I don’t think I’ll fit into my jeans this winter so I can’t wait to sink my teeth into this, literally. Thanks so much for sharing at Thriving on Thursdays last week. I’m featuring this one at tomorrow’s party. Hope to see you and Stacie again. Your recipe is featured on Full Plate Thursday this week. Hope you have a great weekend and enjoy your new Red Plate! This makes a great lunch. I can see my daughter loving this! Salads are the beat for the summer weather.